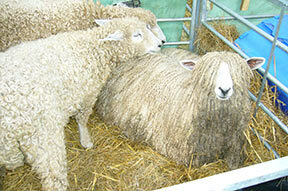 Here are some pictures showing the equipment I use and some of the fleece providing sheep. 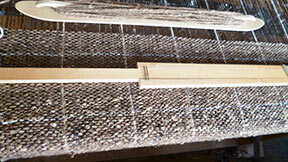 On the left is my upright 'Harris' rug loom, 27" weaving width. 2 shafts so good for tabby weave. Made of solid Mahogany. 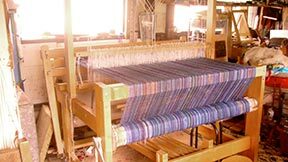 At top right is the 'Macomber ad a harness' 40 " weaving width. There are 4 shafts on it but there is room for 12, made in the USA and is a jack loom, made in 1971 of Maple wood. 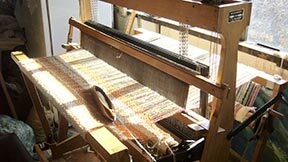 Below that is the 'Varpapuu Finlandia', approx 43 " weaving width, a countermarche loom with an underslung beater, as its name suggests, made in Finland in the mid 80s out of heavy Birch. As for spinning wheels, these keep changing but at the moment I am very happy with the collection. 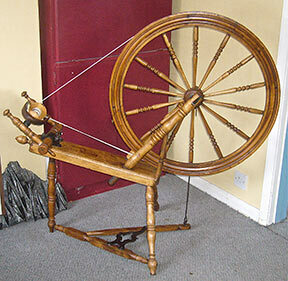 The first wheel I bought new was in 1997, a 'Louet' S51, modern style made in the Netherlands, I learnt to spin properly on this and have recently added the new art yarn flyer to it so that much thicker yarn can be run through. A couple of 'Ashfords' came and went, then I added a 'Timbertops' English Oak chair wheel and a 'Timbertops' flat bed Oak 'Leicester ' wheel. 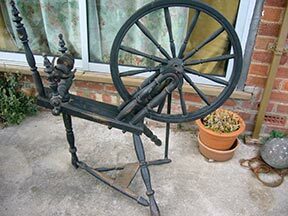 Then came the oldies, well, they found me really, how could I turn a blind eye to little Dottie, an antique Dutch flax wheel, seen left, still smells of old church interior, it has an onboard lazy kate and on the back its own yarn winder. Very tricky to treadle as the small wheel needs to revolve very fast. 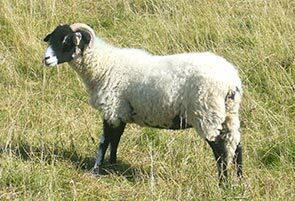 Its distaff consists of old compressed moss or cork like substance. 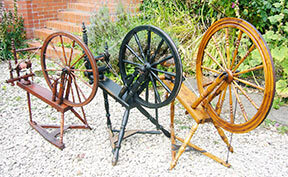 The picture to the right shows three big Saxony style wheels, left here is a very delicate and temperamental Scandinavian wheel, I think it is fruit wood, very light and would do well in a longest thread competition, Dont know its exact country of origin but its table end is stamped twice with a large K surmounted by a crown. 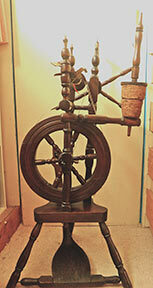 The treadle has a worn footprint dent from someone long gone, this is the style of treadles from Finland, 23" wheel. Made in about 1880 by Louis Simeon Laurence 1834 -1897 in Rue des Cascades, Ste Hyacynthe, Quebec, Canada. Simeon was the brother in law of Michel Cadarette who lived next door and also made these fine machines. Made of Canadian maple with iron treadles and mother of all mountings they are typical of what are known as Canadian Production Wheels, specifically they have a tilt tension mechanism and sport 30" drive wheels. There are still many about in the US and Canada, but as far as we know only 2 definately signed ones by this maker exist and possibly a third but it seems this is the only one by this maker in the UK, I know of a couple of other CPW's in the UK, one owned by a Ravelry friend of mine made and signed by Cadorette. How they made their way over here one can only guess, but they did and they spin like a dream. 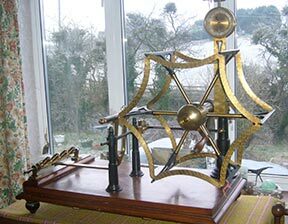 Mine I found in an antique place near Stratford-on- Avon in 2004 and was covered in the usual alligatored finish, all tarry and black laquered, the whorl was seized on, a few repairs were made, oiled well and a new drive belt fitted and off she went. 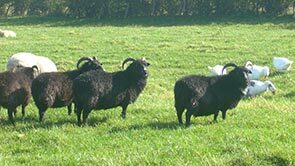 These wheels fly like the wind and are such a joy and wonderful experience to use, the ratio on this one isn't too bad at 15/1, some are much faster, but were designed for production spinning of fine wool mainly for weaving. 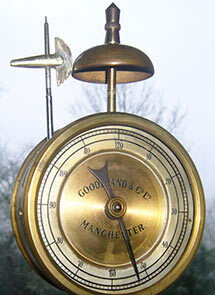 I have a new Ashford e spinner and an older Russian model but they are quite souless compared with the above. With my passion for old yarn processing equipment I added another item to this list last year, it is this Victorian wool winder / tester from Manchester, manufactured by Goodbrand and Co. seen right, in fact in the next street to where my Grandmother used to live as a girl. 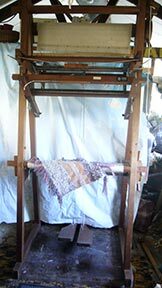 Every revolution of the handle causes a little hammer at the top to ding denoting 120 yards, very useful for measuring skeins, its ingenious and the yarn travels back and forth on its carriage loading the wheel.